Today Zopa has lent its one billionth pound. In doing so, Zopa, the world’s first P2P lender, also becomes the first UK platform to cross the billion pound landmark. To put this achievement into context, it was only at the beginning of 2014 that the entire UK AltFi industry crossed the £1bn mark. Over its lifetime Zopa has originated £225m more loans than Funding Circle, the second biggest UK platform by cumulative origination.However just four months ago, it did not appear a certainty that Zopa was going to be the first UK platform to reach the billion pound mark. Indeed, we published an article in April in which regression analysis showed that the UK’s top three platforms could all reach £1bn within weeks of each other and that would be towards the end of the year. Figure 2: Cumulative Zopa’s origination volume showing regression analysis as of April (dotted grey) and today (dotted orange). A clear inflection point can be seen in April. 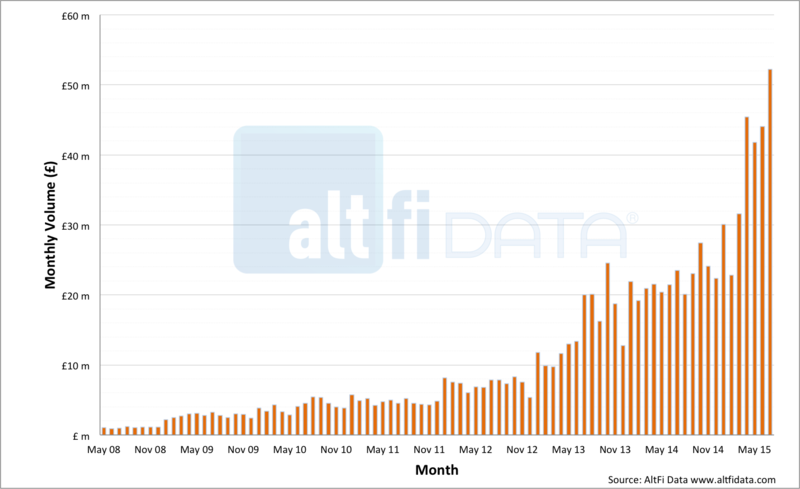 It can be seen in figure 1 that there was a step change in Zopa’s monthly origination volumes in April of this year. Monthly origination volume virtually doubled from ~£25m a month between April 2014 and March 2015 to ~£45m a month since. This step change is also observable in Zopa’s cumulative origination shown in figure 2 – a clear inflection point can be seen in April this year as the cumulative origination line gets markedly steeper. The regression analysis depicted by the dotted lines in figure 2 uses exactly the same method and is carried out as of April and as of today. The differing slopes of the extrapolated lines highlights the change in origination pace. Zopa is now on course to have lent £1.25bn by the end of 2015 which tallies with its stated aim of completing its second billion of lending in 2016. So what’s changed? Figure 3: A breakdown of Zopa’s monthly lending by Safeguarded and non-Safeguarded loans. What is driving Zopa’s growth? The chart in figure 3 goes some way to explaining this. It shows the breakdown of safeguarded and non safeguarded loans by origination month. Non safeguarded loans are only open to institutional investors. Examining the chart reveals that Zopa’s institutional lenders have grown much more rapidly than its retail lenders with institutional lenders accounting for 56.3% of origination volume in July, having lent £29.4m, up from £8.2m in March. Figure 4: Gross interest rates of safeguarded and non safeguarded loans. This diversification in the supply of capital has coincided with an increased diversification in the type of borrower to which Zopa is lending as can be seen in figure 4. Judging by the gross interest rates, institutional lenders appear to have a higher risk appetite than Zopa chooses for its retail lenders. Institutional gross lending rates were 415bps higher for the month of July. In addition to Zopa no longer having to turn away as many risky borrowers, some of these new borrowers will also be from new partnership schemes such as the Uber tie up that Zopa announced in May. The blend of institutional and retail money certainly seems to be working for Zopa’s volumes right now. It’s great to see the platform buzzing, innovating and leading the pack still after 10 years in the fray.